Building upon the success of best-sellers The Clean Coder and Clean Code, legendary software craftsman Robert C. "Uncle Bob" Martin shows how to bring greater professionalism and discipline to application architecture and design. What are the best high level structures for different kinds of applications, including web, database, thick-client, console, and embedded apps? What are the core principles of software architecture? What is the role of the architect, and what is he/she really trying to achieve? What are the core principles of software design? How do designs and architectures go wrong, and what can you do about it? What are the disciplines and practices of professional architects and designers? 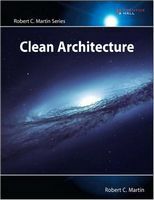 Clean Architecture is essential reading for every software architect, systems analyst, system designer, and software manager -- and for any programmer who aspires to these roles or is impacted by their work.